My name is Randolph. Randolph Clark Rodriguez. They call me “The Invincible Randy” on the space convoy circuit, but you can just call me Randy. I roam the galaxy on my trusty ship, the Capstar II, fueled by dreams, passion, adventure, and the promise of cold, hard cash. My job is hard to explain, but in a nutshell, I’m a jack-of-all-trades who takes on any request under the suns. My latest task is to collect the rare mineral called Red Krypton from Point K9. I hear, though, that the last fellow sent to Point K9 never returned… Something tells me that there’s more to this mission than they’re letting on. Nevertheless, today finds me and my faithful Capstar II headed for the four planets that make up Point K9. After all, it’s there I may find dreams, passion, adventure… and a sweet, sweet 40,000,000 Space Credits. 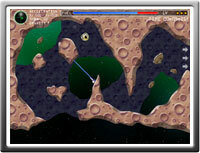 Your task is to maneuver the spaceship Capstar II through mine shafts and collect the Red Krypton within. However, Captain Randy’s beloved ship is an old piece of junk with bad fuel economy. You’ll have to use your boosters efficiently as you navigate around obstacles toward the center of the mineshaft. Each planet consists of four stages. In the first two, your job is to move further into the mineshaft, while the third stage is where you are to collect the Red Krypton. 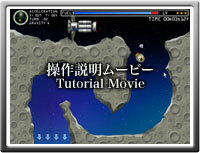 In the fourth stage, your challenge is to dock back with the mother ship while avoiding the attacks of the mysterious Space Pirates. The gravitational force will be different from planet to planet and even from stage to stage. If the Capstar II hits a wall or an obstacle, it will take damage and lose energy. Using the boosters will also cost energy. If you run out of energy, the game is over. However, collecting the Blue Krypton found in some stages will replenish your energy supplies. Also, some obstacles can be destroyed using your boosters. A dandy who’s never without a cigarette and a chronically penniless starship captain. He commands a crew of one: himself. With his dreams, passion, adventure, and decidedly retro spaceship Capstar II, he seeks an honest living. 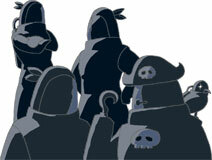 An enigmatic group of pirates who haunt Point K9. They use the latest-model Capstar ships, and they’re clearly large-scale and well-funded, but their true motives remain unknown. Click “Game Start” on the title screen to start the game. You can adjust the difficulty settings before you start. 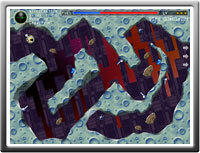 There are five levels of difficulty, with level 5 as the hardest. 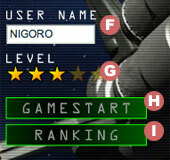 If you enter a username at the title screen, you can participate in the high score rankings. Click on the Rankings Button to view high score rankings, which are grouped by stage and difficulty. Once you clear a stage, you can also return to play that stage by itself from the rankings screen. 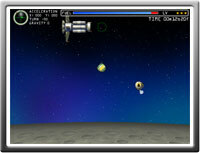 The game begins when the Capstar II arrives on the planet. Click to separate the pod from the mother ship. Your Capstar Pod will rotate following the movements of the mouse cursor. Click to fire your boosters. Maneuver your Capstar Pod through the stages to accomplish your mission, carefully taking gravity and acceleration into account. If the Capstar Pod hits a wall or an obstacle, it will take damage and leak a certain amount of fuel. Using your boosters will also consume fuel, so be careful not to run out of fuel as you navigate. If your fuel runs out, it’s game over for Captain Randy. Each mission is comprised of four stages. 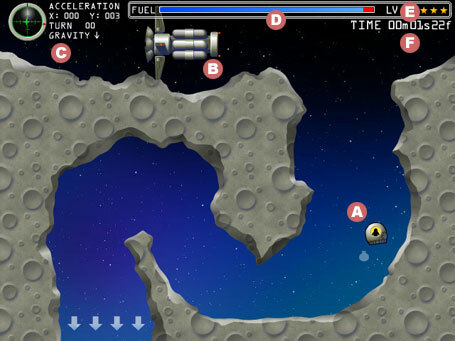 In the first two stages, when you’re navigating through the space mine, the stage is cleared when the Capstar Pod reaches the arrows. The retrieval stages are cleared when you reach the rare Red Krypton. The docking stages are cleared once you move the Capstar Pod into the docking area in front of the mother ship. However, your speed must be below a certain level, or you will be unable to dock. A strange ore with a red glow. People pay good money for it for some reason, which is all you need to know. An even stranger ore that glows blue. Crushed, it can be used as a substitute for starship fuel. Pick it up to completely refill your fuel tank. 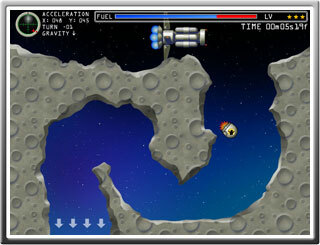 A defense system set up by the Space Pirates. These can also be destroyed with your boosters. Rocks that get in your way in space. They can be destroyed with the Capstar Pod’s boosters. If they detect anything nearby, they explode. A group of pirates wreaking havoc around Point K9. They try to obstruct your docking procedure.